Lydia Dwight was six years old when she died on 3 March 1674 (1673 by the Old Calendar). Although the commissioning of such a piece of sculpture suggests no lack of grief on the part of the parents, as usual in an unsentimental age noted for its high infant mortality, the next daughter was also christened Lydia. John Dwight's first patent for salt-glazed stoneware, of 1672, did not list statues and figures among the types of product to be protected. They were, however, included in his second patent of 1684, when he had apparently stopped making them. Almost all his figures, like these two examples, were actually made in the 1670s. He is known to have shown a bust of Dr Willis and a figure to members of the Royal Society in 1674 and was clearly attempting to adapt his tough new material to the delicate art of modelling in clay, terracotta or wax at exactly the time his daughter Lydia died. The identity of the four different modellers involved in his experiments, assumed to be from Italy or the Low Countries, still remain a mystery. Dwight's failure to make commercial use of his stoneware figures has denied him the role of founder of the later tradition of English pottery and porcelain figures. But his attempts to link the stoneware material to art does have parallels with Josiah Wedgwood and Sir Henry Doulton in the 18th and 19th centuries. Standing figure of a girl, Lydia Dwight, with clasped hands, wearing a shroud, with a skull and flowers at her feet. 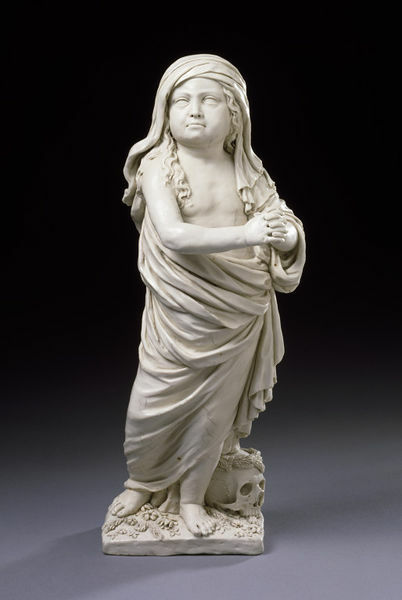 White stoneware figure of a girl, Lydia Dwight, wearing a shroud, with a skull and flowers at her feet. English, ca.1674. Made at John Dwight's Fulham Pottery. Mavis Bimson. John Dwight. In: English Ceramic Circle Transactions. London, 1961. Volume 5, Part 2, p.101, plate 112b. This figure was made at Dwight's Fulham pottery using techniques patented by him. 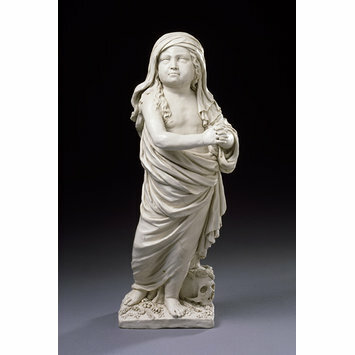 1055-1871 is another figure of Lydia Dwight made at the Fulham Pottery after her death.